Aarav's journey to hearing......: With and without ears?? 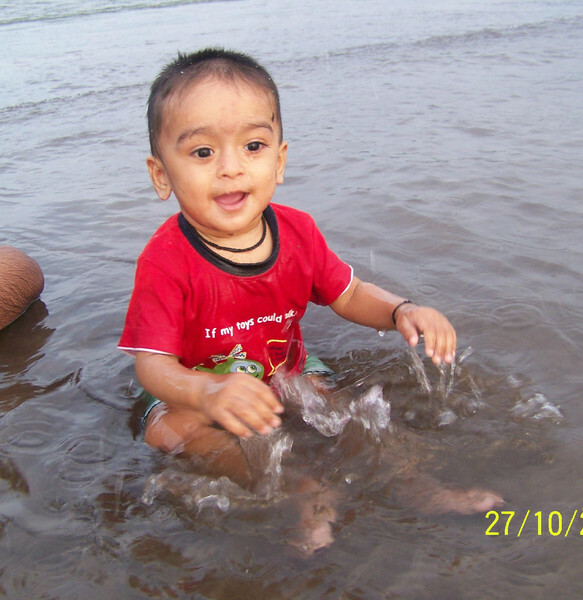 We took Aarav to the beach for the very first time when was 10 months old. He LOVED it. He played for almost three hours straight. Played in the sand, made castles, used the sand as a face and hair pack, even rolled around in it! He was not walking back then, just crawling. Even that dint hold him back when in the water. He crawled right in and faced the waves! He dint even care to check if we were around, he was that engrossed in playing. In 2 days that we stayed, we visited the beach 3 times and Aarav played every single time. I was literally out of Aarav's clothes by the time we returned. Last year after Aarav's surgery, around July, we went to the beach again. This time we were not worried that Aarav would get scared, so we put him in his water shorts, and took all his sand toys. When we reached the beach, I removed the Neptune, kept it in the car, and then carried Aarav to the beach. This time, however, without his hearing, he REFUSED to play. Or even leave my side. He was cranky and just wanted to go back. My fearless baby of 10 months was now afraid when at 20 months age?? It was then that I realised the difference. At 20 months, post implant, Aarav wanted to hear. His new ears were now a part of him. No ears and complete silence now meant that something is not right.